Daisy Duck is given the Syroco treatment. This Daisy Duck Statue is limited to just 850 pieces! Packaged in a tin box that includes a pin-back button and character booklet. Hope springs eternal, and Daisy Duck's hope of taming the volatile Donald is certainly an eternal spring! Daisy is given the Syroco treatment by Dark Horse and Yoe! Studio in this delightful Daisy Duck Statue that's limited to just 850 pieces. She measures 4 1/2-inches tall and comes packaged in her own tin box that includes a pin-back button and character booklet. Hope for her no more. Acquire! Ages 13 and up. 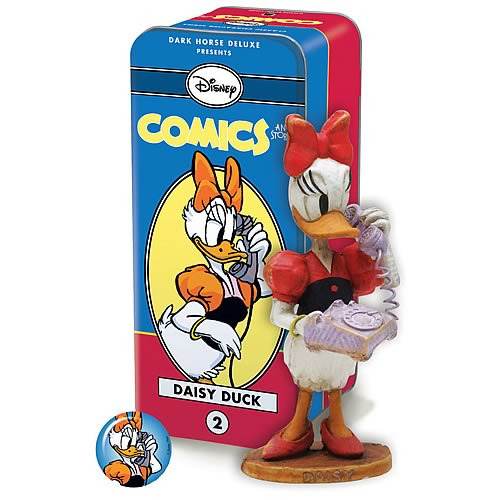 The Disney Comics and Stories Characters series depicts the cartoon characters as they were in the comics, but the pieces are also somewhat more roughhewn than is common, with features including rough surface textures, visible seam lines, and other slightly "distressed" aspects.